Lessen the Effects of Thanksgiving Dinner! 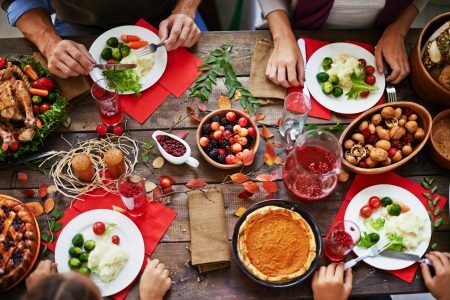 While I would never suggest that you skip your favorite Thanksgiving goodies, this article shares some sensible tips to make the festivities a happy memory rather than a regret! We're not suggesting you roll up on your sofa, here are a few suggestions. We all know after an over-stuffed dinner is to lie down and rest. Instead take a short walk after your meal helps your digestion over drinking coffee. Drink some digestif bitter which is produced in Rheinberg in Germany by Underberg AG, made from aromatic herbs from 43 countries. Most European counties create a bitter herbal digestive liqueur that's sipped after meals. (Italy produces hundreds of different types of Amari. Keep on hand a natural digestive enzyme for after the feast. There are reasons ginger is often used to for stomach upset: It works! Thanksgiving is a holiday of gratitude and family, indulgence and indigestion. Embrace the former while ditching the latter with these actionable ways to limit your belly-bulging binge at this month’s high-calorie celebration of appreciation and appetite. via 6 ways to lessen the gut-busting effects of your Thanksgiving binge.